Our Year 6 children put on a fantastic display of talent in an emotional service at St. Michael's Church, Framlingham yesterday afternoon. There was poetry, creative writing, art work and music. Every child received an award from the school and a gift from the church. In a spectacular finale the children sang 'Happy ever afters' from their recent school play. Alfie Demmon (one of our year 6 leavers) has been one of most talented musicians over recent years. Unfortunately he missed our leavers service due to illness. He would have performed the guitar piece 'Heart of Spain'. Luckily I recorded Alfie a few weeks ago. Here he is in action. 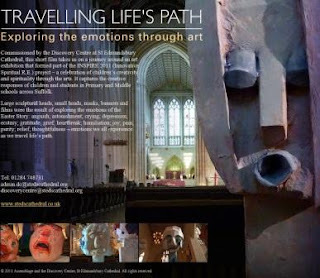 Click on the picture above to see a film based on the Inspire Sculpture project which some of our children took part in. As the first two terms of my Headship at Sir Robert Hitcham’s CEVAP School draws to a close, I would like to take a moment to reflect on the recent past. So much has happened in a short space of time that it is difficult to reconcile that I haven’t been your Headteacher for a year yet! I have been made to feel so welcome by the children, staff, governors and families of the school and also by the churches in the town and the local community. I have been spending the time since my appointment familiarising myself with our wonderful school, recognising the excellence, and planning for the future. There have been some changes which you may have seen/experienced, for example, the new reporting formats which have been well received by the vast majority of families, the change in the newsletter format and the change of seating arrangements in the hall. There has been much discussion with staff about learning and behaviour which has led to an amended Behaviour Policy which we hope to be able to publish in September. Finally the Governors and I, amongst many other things, have been working with Suffolk County Council to solve the issue of the Crossing Patrol which hopefully we will have in place for September, if there are applicants for the position. The parent questionnaire responses (from Reception, Year 2, 4 & 6) have been extremely useful in the future planning for the school and we are very grateful for the time taken by families to share their thoughts. Many of your responses have already been shared with staff and to that end some of the changes which have occurred already have been initiated through your involvement. During the past two terms I have been pleased to meet so many families and to get to know your children, who are wonderful. They have really helped me to settle in to our school. I do hope that you have a lovely summer break. Mr Brook has put together a series of films covering the last year in school. They are mainly about our leaving year 6 children but there are some images which the rest of the school will find interesting. It has been an eventful year with two lots of snow in the Autumn Term, the Gas emergency in the Spring, lots of sport, a school production and the Royal Wedding Day. Each film has some music from the last 12 months which I hope you will enjoy. This first film looks back at the Autumn Term. This next film looks back at the Spring Term. The Summer Term has been long and very busy so there are 2 films - one for each half term. The children and staff from year 6 enjoyed a brilliant week of camping and activities in North Norfolk. As you can see from the photos, the children took part in a wide range of artistic, adventurous and wildlife activities. It was a pleasure to spend a week with these children. They got on with each other so well and willingly helped out with all of the hard work required on a camping trip. The staff have never seen a group with so much energy. A huge thanks goes to our 3 young helpers (Amy Brook, Emma Sayer and Laura Revell), the teachers (Mrs Morgan, Mr Vaughan, Mr Brook, Mr Byer and Mrs Monk) and especially to Mr Harte for cooking our food throughout the week. The Leavers’ Service will be held at St Michael’s Church on Thursday 21 July at 1.30pm. Parents are warmly welcomed to this event. Pupils in classes DB/GM, RV, NS/JB and GH will attend with any younger siblings of Year 6 children who are in other classes. We would like to thank the parents of Year 6 leavers who have kindly contributed to this collection, and are delighted to let you know that we have raised enough to buy a picnic bench that will be sited on the back playground, bearing a plaque from the 2011 Leavers. SCC Catering have arranged a special lunch this Friday of Fish Surprise or Cheese and Leek Bake, Chips, Baked Beans, Sweetcorn, followed by a Raspberry Ripple Tub dessert. Classes PLDD & PSKM will be baking for this cake stall on Friday in the Playground on behalf of the Friends. Please remember to bring in some pocket money to buy an end of term sweet treat! Mrs Pascoe would like to thank all those kind parents, Governors and staff who contributed to her leaving collection – she is delighted with her present…. a Maypole! SCC Catering have decided to change to the Primary School menu from September, with this letter please find a copy of the new menu, please destroy the old Middle School menu. If you are purchasing a new school bag for your child in the holidays, please can we ask that you buy as small a bag as is suitable, as we are so restricted for corridor space. In September there are still some spaces for Guitar lessons. If your child may be interested please collect a form from the office. Costs are £42 per term currently. We are delighted to let you all know that Mrs Spencer is expecting her second child. The baby is due in November so Mrs Spencer will go on maternity leave around October half term. 1st place Mills; 2nd place Howard; 3rd place Hitcham; 4th place Bulstrode. 1st place Howard; 2nd place Bulstrode; 3rd place Hitchams; 4th place Mills. 1st place Mills; 2nd place Howard; 3rd place Bulstrode; 4th place Hitcham. To encourage children to read over the summer holiday, Framlingham Library are running a free ‘reading challenge’, this year’s theme is ‘Circus Stars’. The children can register on anytime from 23 July when the scheme starts. PLEASE VISIT THEIR WEBSITE www.suffolk.gov.uk/circus-stars OR ASK AT THE LIBRARY FOR FURTHER INFORMATION. Patrol operating times: 08:25 to 09:00am and 15:00 to 15:25pm plus a ‘lighting’ allowance of 1 hour 20 minutes per week. Total of 6 hours 40 minutes per week at £6.29 per hour. Monday to Friday of each week in term time only. Post is subject to half pay retainer. Post can operate as a job share. Post is subject to enhanced CRB check and medical review. Full training and support will be given to the post holder. The Monday Gym club will not be continuing in September. However the coach is running holiday sessions at Otley Village Hall 29 July – 19 August. Email sehale18@gmail.com for info. the children return to school on Wednesday 7 September. Please note that Thomas Mills High School pupils return to school the day before us (Tuesday 6 September). Mills won the key stage 2 sports day - retaining the trophy from last year. Team catains Georgina and Edward can be seen above with chair of governors Graham Owen. There was some outstanding races this year which demonstrated the sporting talent in the school at the moment. The final scores can be seen on the scoreboard above. Mr Rob Mawson (school governor) came in to present the prizes to our competition winners. Rob (who is a professional writer known as Robert Rasdcliffe) read all of the entries and spoke about the quality of writing he had seen. The senior winners are above and the junior winners below. 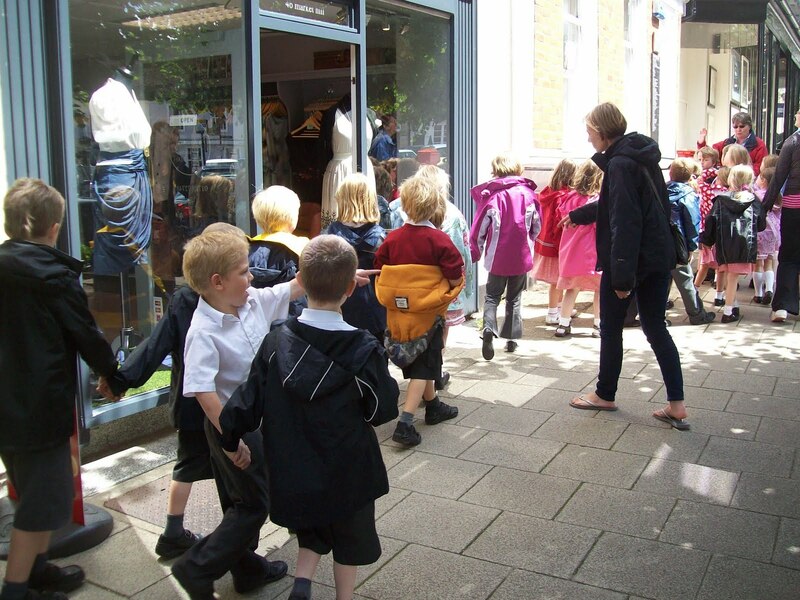 Children from key stage 1 had a lovely walk around Framlingham looking at the pictures in the variuos shop windows. It was a thrill for some of them to see their own pictures on display. Our school cricket team (pictured above with Mr Devon Malcolm - former England fast bowler) finished very close to qualification for National Finals. After winning all of their group games in the morning vs teams from Cambridgeshire, Norfolk and a team from Essex the boys qualified for the knockout stages in the afternoon. Framlingham won a very tense and exciting quarter final but then were unlucky in the draw for the semin finals to be paired with the champions of Essex. The boys were nervous in the game because they knew that the winners would get to the Nationals. Fram bowled first and got off to a poor start. Essex had some very powerful batters early on. However, Fram hit back to take several late wickets and keep their score down. The Essex boys also had some good bowlers and despite getting off to a good start Fram finished 12 runs short of victory. The team were very disappointed to finally lose a match (after 16 straight wins this season) and frustrated to hear that the runners up from our group in the morning (from Norfolk) had made it through to the final (and guaranteed entry to the Nationals). However, as the watching Suffolk cricket manager said to the boys: they should be proud of the way they had represented their school and the county of Suffolk. 150 Suffolk schools had entered this years competition and over 1000 schools in the East. So finishing 3rd was a great achievement. The boys have had a brilliant season and become a close group of friends through their exploits. It has been a pleasure to coach them and watch them play. I would also like to thank Mr James Cantrell for his help throughout the summer. Foundation and Key Stage 1 9.30 - 10.30am / Key Stage 2 10.30 - 11.30am. If the weather should be inclement, the reserve day is Wednesday 6 July at the same times. Please ensure that your child has their PE kit (KS2 House tee-shirt) and a water bottle. A sun hat and sun cream are advisable. Children are allowed to wear trainers. If you are able to volunteer help at Sports day please see Mrs Spencer. SHARE SESSIONS REMINDER – DB/GM – TUES 5 JULY and RV - WEDS 6 JULYJust to remind Year 6 parents that the Share Session this week start at 1.20pm. VIOLIN ASSEMBLY – Wednesday 6 July 2.30pmWe would like to invite any interested parents (of children who will be in Year 3-6 in September) to this assembly when music teachers and students from the High School will be introducing pupils to the Violin and Viola. They wish to promote the string instrument lessons that we hope to be offering here from September. Please come along if you would like your child to have these lessons and want to hear more. REPORTS OUT ON FRIDAYPupils in Year 1-6 will be given their reports this Friday, please can we ask you to remind your children that the reports are addressed to the parents and should not be opened until they are handed over to you. If you feel that you would like to speak to your child’s teacher about the report, please arrange this directly with the teacher next week. CINDERELLA AND ROCKERFELLAThe upper KS2 performances last week at the Headmaster Porter theatre were a huge success; the audiences and cast thoroughly enjoyed the shows. Congratulations must go to all the performers and many thanks to all the teachers and parents who put in so much work to make this the success it was. Mr Brook is making copies of the photos on CDs and also some video clips on DVDs, which will be for sale: Photo CDs will be £2, DVDs will be £3. Order forms are being given out to UKS2 separately. Proceeds (after costs) will go to the Friends. Please note photos should not be put onto any internet sites, unless they are of your child ONLY. The collection at the end of the shows raised £369 part of which will cover costs of costumes etc, the balance of the proceeds will go to our nominated charity EACH. FRIEND’S FUNDRAISINGThe Friends are delighted to let you know that the raffles at the productions raised £255.80. 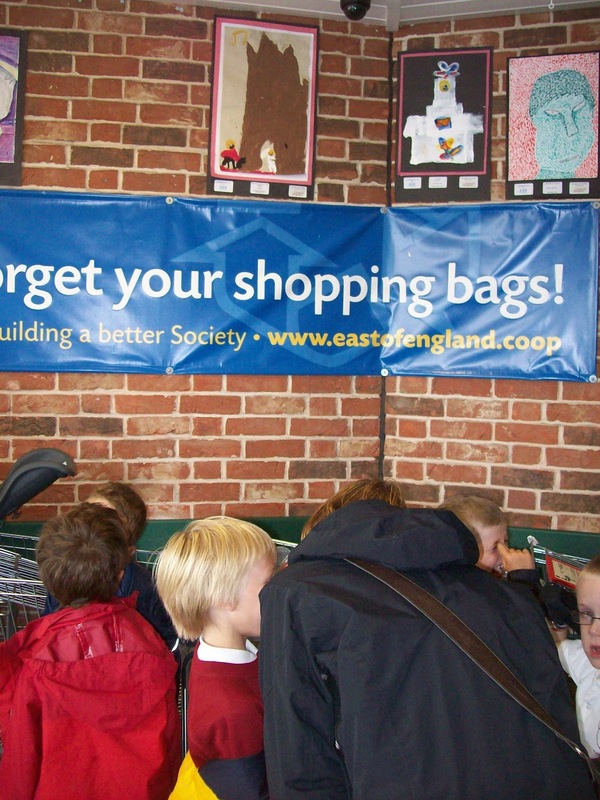 The Bags2School collection held in June, raised £220 towards Friends funds. NURSERY SPACES IN SEPTEMBERWe wanted to make parents aware that we still have spaces available in our School Nursery in September. 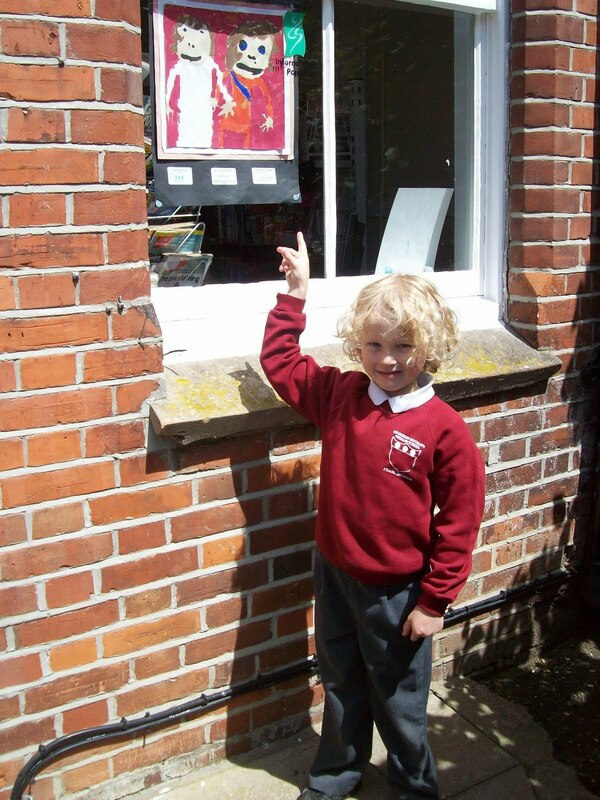 If you have a child born BEFORE 31 August 2008, or have friends with children of this age, do please come to the school office to get a Nursery brochure, application form and arrange a time to look around the Nursery before the end of term. FILM NIGHT – FOOD & DRINK ALTERATION for FridayThe Friends are sorry but there will be no Bar at Gnomeo & Juliet, only soft drinks this time. Also a reminder that they will not be selling hot-dogs. Normal service for these will return at the next film night in the Autumn. Apologies for any inconvenience! SORRY – We can accept NO MORE CERTIFICATES to be given out in Assemblies this term. The reception children got quite a surprise this week when they found a duck nesting in their vegetable garden. It is sitting on some eggs and does not want to move. The children have given her a tray of water. Class CH have also been collecting mini beasts. They also have a tank with stick insects which some of the children like to handle. We hope you like these photos from a fantastic production. Many more will be available next week on a CD which you will be able to order (proceeds to Friends Association). The Headmaster Porter Theatre (at Framlingham College) was full to the rafters yesterday as our upper key stage 2 children produced two 5 star performances. The story of Cinderella came alive with an array of outstanding performances. From rock and roll dancers to love and first sight, each and every child contributed to a thoroughly enjoyable performance. Amelia Shroeter (as Cinders) and Billy Caiger (Rockerfella) wooed the audience with their fairytale romance whilst the ugly sisters (Alfie and Ewan) and fairy nastyboots with Naughty Kitty (Nathan and Chloe) tried (and failed!) to halt the romance. With a little help from the fairy brigade and fairy godmother (Molly Constanti) love did blossom and happily ever after was sung by all.